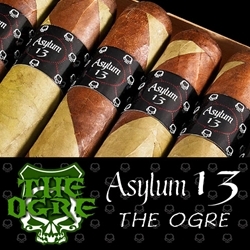 Known as the Barber Pole monster, Asylum 13 The Ogre hand-rolled premium cigars are wrapped in dual Nicaraguan Habano and Candela wrappers. Asylum’s highly skilled cigar rollers make sure these monsters are packed full to the brim with Nicaraguan filler & binder cores giving them the most complex and intriguing puro cigar you'll ever smoke. Sizes start from large to OMG!! A super BIG smoke in a super-sized way! Go Asylum and grab one of these great premium cigars today! Try one of the varieties of sizes and flavors listed below. Each of these styles are available for a discount price! Call us for more details!